Unlike other vacuum sealing machines, Food Saver has managed to take the regular day to day food related problems of the common man in today’s fast paced world and combined them into one beautiful compact and largely portable solution: The Food Saver Vacuum Sealing Machine systems! Healthy, safe, fast, environmentally and economically friendly, the Food saver machines manage to secure the original freshness and succulent taste of all your favorite food items in its original form for longer than any other storage options available! We have also written a complete guide about best compact refrigerators. Some of the most common Food Saver machines today are fully automated in their functioning. This means you only need to place your food in the bag material and let the machine induce vacuum and seal it off adequately. Furthermore, they will also have different functions for different types of food items ranging from moist to dry settings while others will also provide settings for vacuum speed as well. You also have the option of marinating your food in a timely and quick manner. Other Food Saver machine models have a manual functioning module. This means that the user will have to individually place a bag into the sealing compartment for it to be made airtight and consequently sealed as well. Furthermore, majority of the manually worked models have simple control panels with minimum controls to choose from hence making the functioning of the machine very easy and basic. One of the common models in the Food Saver vacuum sealing machines incorporates the ability to create custom sized bags. These are done via a retractable bag making roll that is attached within the machine and allows the user to see exactly where the seal is being put. By doing so the user is also reducing the amount of bag material waste and reducing the amount of excessive storage space. For outdoor enthusiasts that enjoy hunting, camping and fishing, it is always a good idea to opt for a Food Saver Vacuum sealing machine which is not only portable but also easy to carry around. These models don’t utilize a high amount of energy and can easily be attached to the power surge coming from pick ups and boats a like. Furthermore, they are built for fast vacuum sealing to save time and excessive energy when on site. 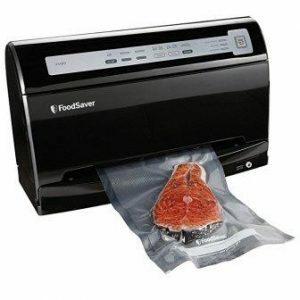 With the Food Saver vacuum sealers users can save up a lot of time otherwise spent on frequent grocery runs! By sealing away perishable grocery items, you have the luxury of using them at your convenience whenever needed. Unlike freezing and storing away your food in Tupperware and ill-fitting bags, vacuum sealed packages are easier to store and take significantly less space! One of the best advantages of getting Food saver vacuum sealer machines is that majority of them come with dual functions whereby you can employ the machine’s own sealing setting as well as use the portable hand sealer for external packages and cannisters. With the food saver vacuum sealer machines, you can seal and reseal several different packages to increase overall food shelf life of a variety of different food items. One of the important features to consider when opting for a food saver vacuum sealing machine is to look for a retractable dishwasher friendly drip tray. This will not only make maintenance all the easier but will also increase your appliance’s overall lifespan. Furthermore, users don’t have to worry about spending extra hours handwashing the tray as well. Having the option of replacing your baking making roll is very important when opting for a food saver machine. Some of the models come with a transparent shield that allows users to track the amount of bag making material being employed. This not only reduces the amount of excessive bag material otherwise wasted but also makes sure that the bags are cut and sealed to custom sizes that are easy to store away. Other than having an integrated sealer within the vacuum sealing machine, it is also important to look for a sealer that comes with an external hand-held sealer. This allows users to airtight seal several different containers including zip lock bags and cannisters which don’t need to be put through the machines vacuuming and sealing process. Opting for a food saver machine that comes with user friendly controls will allow the user more control over the kind of sealing that they are looking forward too. This also means that despite completely being automated or semi-automated, the user can easily choose the right functions without worrying about wasting time or bag making material by sealing the wrong way. 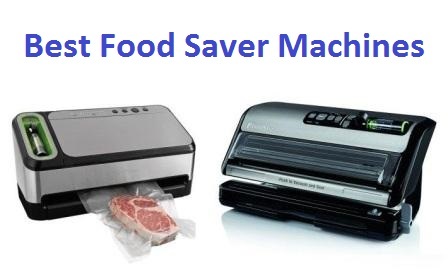 Some food saver machines are easily transportable which is a great option to consider if you are an outdoors enthusiast or enjoy going for hunting and fishing. The portable food saver machine comes with an easy access adapter and a sturdy body to withstand the uncertain terrains. Furthermore, it can put airtight seals at a faster rate than other vacuum sealing appliances. Having the liberty to choose between your preferred functions also gives user more control over how the choose to store away their perishable items. These common functions include choosing between the vacuum speed, moist or dry items as well as a mode for marinating food faster. A vacuum sealing machine that can place wide heat seals means that the seals will be sturdy and will be able to withstand through time. This also means that the seals will be more airtight and have a better chance of keeping food fresher for longer. Having already established the core reasons behind what makes Food Saver vacuum sealing machines some of the best in the industry, we have also put together a list of the best models from the company to make it easier for you to make your pick depending on your personal choices and preferences! Check outt our complete guide about best stock pots. With the FoodSaver 2-in-1 Vacuum Sealing System with Starter Kit, 4800 Series, v4840 food never felt so fresh and easily storable! The food saver machine also helps marinate food faster and store it for longer by protecting it against heat and air that could spoil it faster. 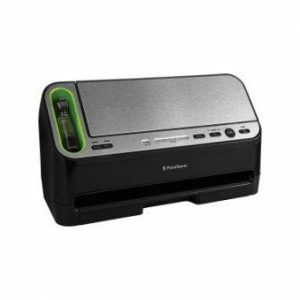 The FoodSaver 2-in-1 Vacuum Sealing System with Starter Kit, 4800 Series, v4840 comes with high grade BPA free multilayer seal bags that help keep the air out and make sure the food stays fresh for longer durations. Furthermore, you can also reseal the bags frequently especially for refrigeration and pantry storage. The seals are double locked to help keep the air out to maintain maximum freshness. Whether you are planning on using the roll storage given in the machine or sealing away your own zipper bags and other containers, the FoodSaver 2-in-1 Vacuum Sealing System with Starter Kit, 4800 Series, v4840 allows you to do both at your own convenience. With the retractable handheld sealer users can seal multiple different containers from zip lock bags to cannisters to help preserve food for long. On the other hand, the roll storage cuts out bags of custom size to marinate and store food. One of the best features of the FoodSaver 2-in-1 Vacuum Sealing System with Starter Kit, 4800 Series, v4840 is that it comes with a pull-out drip tray that makes it easy to clean the food saver machine from within. The drip tray is also dish washer safe which means that you can stack it with other cutlery to get it cleaned in optimum time. Sealing can be done on two different settings; dry and moist, according to the food item. The machine comes with its own food saver bags and plastic rolls to add to the overall convenience of storing food in an optimal manner. There is a separate rapid marinate mode given in the food saver machine that allows for marinating food fast for early consumption. Some users complained that the machine did not work optimally with big bags and would get clamped occasionally or not hold the vacuum seal in properly. With the FoodSaver New FM5000 Series 2-in-1 Vacuum Sealing System Plus Starter Kit, FM5200 you not only have access to fresh food but also ultimately reduce significant costs and storage space associated with bulk buying! The machine allows you to track your sealing process hence giving you more control over the sealing process. The roll storage area of the FoodSaver New FM5000 Series 2-in-1 Vacuum Sealing System Plus Starter Kit, FM5200 is easily visible and accessible to help users keep track of how much is being used and when to replace it. Furthermore, the machine allows for 50% faster bag making which ultimately reduces time and automatically sets the space for the next bag’s seal. One of the best features of the FoodSaver New FM5000 Series 2-in-1 Vacuum Sealing System Plus Starter Kit, FM5200 is that it allows users to track the exact angle and space that they are sealing their bags and at the same time also comes with an automatic sealing process to make the process faster and easier. The former makes sure you are reducing approximately 30% of the roll used in sealing by monitoring where the seals are made while the former is a great option when you are looking for fast and bulk storing. The FoodSaver New FM5000 Series 2-in-1 Vacuum Sealing System Plus Starter Kit, FM5200 comes with an easily accessible pull out drip tray that accumulates all the overflowing liquids to protect the machine’s internal mechanism which would otherwise be difficult to access. Furthermore, the drip tray is also dishwasher friendly which means that you don’t have to worry about spending extra time handwashing it. A second heat sealing bar automatically sets the space for sealing the next bag of your preferred length and size. You can easily marinate your favorite foods in optimum time and space. The machine also has a retractable system whereby you can seal different containers, cannister and zip lock bags at your own convenience without having to use the bag sealer integrated into the machine. The plastic roll compartment does not cater to large sizes and is not suitable for marinating and sealing away items requiring large bag seals. For all outdoor enthusiasts, the FoodSaver GameSaver Big Game Vacuum Sealing System, Designed for up to 80 Consecutive Seals, GM710-000 is your lifesaver! There is no better way to preserve your day’s prized catches for longer than with this food saver machine that is easily transportable to any remote location! 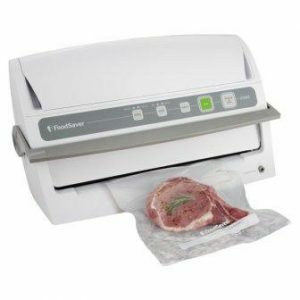 Perhaps the best feature of the FoodSaver GameSaver Big Game Vacuum Sealing System, Designed for up to 80 Consecutive Seals, GM710-000 is that it is easily transportable to any location you desire. This makes it one of the most sought-after food sealer by hunters and fisherman who wish to preserve their prized catches for longer. The machine is lightweight and rugged in nature to make it easy for carrying around. Furthermore, the 12-Volt adapter allows users to power it up against several different locomotives like pickups and boats. 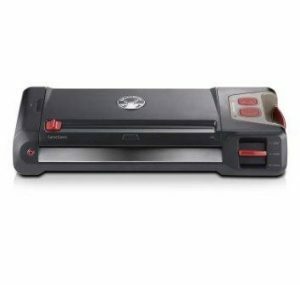 The FoodSaver GameSaver Big Game Vacuum Sealing System, Designed for up to 80 Consecutive Seals, GM710-000 comes with large rubberized for making it easy to be used by users. Furthermore, the rubberized buttons also mean that they can be easily cleaned and wiped down when required. The control pad is fairly comprehensible making it easy to be used by anyone. Whether you are looking for heavy duty seal jobs or just regular ones, the FoodSaver GameSaver Big Game Vacuum Sealing System, designed for up to 80 Consecutive Seals, GM710-000 s built to cater to all your needs! The replaceable foam gasket allows users to add larger and heavy bags without compromising on the strength and air tight features. Furthermore, the regular sealing gasket can make 80 consecutive seals in optimum time without running down! There is an extra-large drip tray given to help accumulate overflowing liquids without ruing the inside of the machine. The Food Saver machine with an extra wide sealing strip for conveniently sealing large bags. The rugged design of the machine allows users to carry it to multiple locations without worrying about extra weight. The machine doesn’t come with separate moist settings which makes it difficult to store fish and other meaty products in their original texture and moistness. Whether you are looking to seal food in custom sized bags or other containers like cannisters and zip lock bags, the FoodSaver V3240 Vacuum Sealing System with Starter Kit allows users to seal away an array of different food items accordingly to preserve their freshness and flavor for longer periods. From speed settings to deciding the moist and dry settings the FoodSaver V3240 Vacuum Sealing System with Starter Kit allows users to seal food according to their own preference and the individual requirements of the food item being sealed. With and easy to read instruction manual, the user can easily understand and work with different settings depending on the food item. One of the best features of the FoodSaver V3240 Vacuum Sealing System with Starter Kit is that it comes with a roll storage space that allows users to create heir own bag sizes to hold food conveniently. Furthermore, the machine has an extra wide sealing strip which helps seal the vacuum air inside the bag tightly to help secure the flavor of the food for longer! The FoodSaver V3240 Vacuum Sealing System with Starter Kit comes with a removable drip tray that helps catch overflowing liquids from ruining the insides of the machine. The drip tray is also dishwasher safe which means you can put it with the rest of the washing and not spend extra time handwashing it. The machine is compact and can be easily stored away when not in use. Furthermore, it can be relocated easily as well as it is lightweight. There is an easily comprehensible control panel given that allows users to choose their preferred setting easily. The compact nature of the machines makes sure it doesn’t take up too much counter top storage space. Some users complained that the sealing feature of the machine broke down after a couple of initial seals. 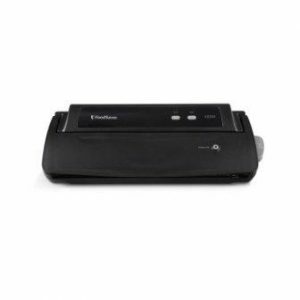 The FoodSaver V4440 2-in-1 Automatic Vacuum Sealing System with Bonus Built-in Retractable Handheld Sealer & Starter Kit, Black Finish utilizes two easy steps when it comes to fast airtight sealing of food items! Furthermore you can also marinate and seal away other containers with the help of the retractable handheld sealer. 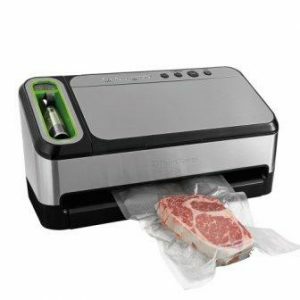 The FoodSaver V4440 2-in-1 Automatic Vacuum Sealing System with Bonus Built-in Retractable Handheld Sealer & Starter Kit, Black Finish is fully automatic and has the capacity to sense the bag and the food type to determine the kind of seal it will require. In doing so it is able to reduce the manual hours and instead makes sure there is an airtight vacuum seal for all kinds of food items. 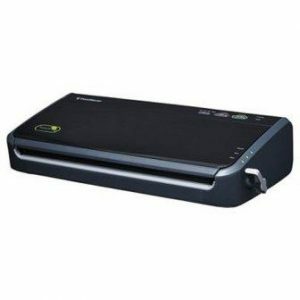 If you are not using the machine for custom sized airtight sealing, you can also use the handheld sealer given part of the FoodSaver V4440 2-in-1 Automatic Vacuum Sealing System with Bonus Built-in Retractable Handheld Sealer & Starter Kit, Black Finish! This allows users to work with other containers like zip lock bags and cannisters for preserving food in them. Moreover, it also allows for easy and fast marinating of food items. 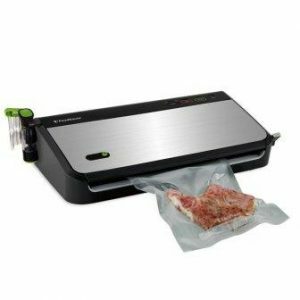 The FoodSaver V4440 2-in-1 Automatic Vacuum Sealing System with Bonus Built-in Retractable Handheld Sealer & Starter Kit, Black Finish comes with an airtight heat sealing system that removes all the air from the bag before using heat seal the bags in an airtight manner to ensure longevity of the food item. The moisture and air is locked out of the bag to ensure that the food stays fresh for longer periods. The dishwasher friendly drip tray accumulates all the excessive liquids hence reducing the amount of mess that would otherwise need cleaning. The package comes with sealing bags and rolls to ensure quality control. The handheld retractable sealer makes it easy to marinate and apply airtight seals to multiple containers like canisters and zip lock bags. Some users complained that the sealer doesn’t seal all bags at the same level and would only seal some properly while the other won’t be sealed as well as the others. Maximum freshness in optimal time, the FoodSaver V3460 Automatic Vacuum Sealing System is built to provide users with the best of the best settings tailored to the food items needs when it comes to airtight sealing them for longevity! The best feature of the FoodSaver V3460 Automatic Vacuum Sealing System is its optimum sealing capacity. With multiple functions for setting the speed of the vacuuming to setting the setting for moist and dry food separately, the machine is fully automated in all functions! You can also utilize the crush free sealing system which is made specially to protect delicate food items. One of the best features of the FoodSaver V3460 Automatic Vacuum Sealing System is its vertical design which reduces the amount of space it occupies on the kitchen counter. This also means that when not in use, users can easily store it away for later use. Moreover, there is also a dishwasher friendly drip tray given which is easily retractable from the machine. This accumulates all the additional liquids that would otherwise destroy the insides of the machine. With the FoodSaver V3460 Automatic Vacuum Sealing System the user has an option of airtight sealing other containers like cannisters and zip lock bags that can not be put through the machine. This external hand-held sealer allows users to seal multiple packages to help save and store away multiple food items for longer durations. The rapid marinate mode reduces the overall cooking time and allows for fast and convenient marinating of multiple food items. The extra wide sealing strip helps provide a solid air-tight seal for maximum vacuum sealing. You can choose your preferred vacuum time according to the food item that you are planning to seal. Some users complained that the vacuuming doesn’t happen successively and will stop after only a couple of uses. Whether you are planning to store away assorted meats or cheese, the FoodSaver FM2435-ECR Vacuum Sealing System with Bonus Handheld Sealer and Starter Kit, Silver is built to accommodate all your needs! The sealer allows you to create custom sized bags according to your convenience so that you can airtight and double seal away food items for longer. Built from high-grade stainless, the FoodSaver FM2435-ECR Vacuum Sealing System with Bonus Handheld Sealer and Starter Kit, Silver is long lasting and can be easily cleaned without corroding or rusting. Furthermore, the stainless-steel construction is quite sturdy hence increasing the life of the sealer on average. Other than the FoodSaver FM2435-ECR Vacuum Sealing System with Bonus Handheld Sealer and Starter Kit, Silver own sealing and vacuuming system, there is an external hand-held sealer given as well that allows users to seal away zip lock bags and other containers at their own convenience. This means that the user is not limited to making airtight bags only with the integrated roll within the machine. With the integrated seal and vacuum storage, the amount of bag waste reduces phenomenally in the FoodSaver FM2435-ECR Vacuum Sealing System with Bonus Handheld Sealer and Starter Kit, Silver. This is because the roll comes with a cutter that allows you to cut at your optimum length hence reducing the amount of excessive plastic being used unnecessarily. The removable dishwasher friendly drip tray accumulates all the excessive liquids that you can then get rid of at your own convenience. The FoodSaver FM2435-ECR Vacuum Sealing System with Bonus Handheld Sealer and Starter Kit, Silver has the capacity for making extra wide seals so that the vacuum accumulated inside the bag is held for longer. It is recommended for bulk sealing that the user allows for at least 20 seconds of break between each seal for optimal performance. Compared to other sealers, this stainless steel one is heavier hence not conventional when required to carry around. Depending on the user’s personal preferences, the FoodSaver FM2100-000 Vacuum Sealing Systemis the perfect addition to any food enthusiasts’ kitchen countertop! This is because the sealer provides extreme control around the settings one can choose from when sealing away food for later consumption along with a conventional design that makes it easy to store the machine away when not in use. The overall design of the FoodSaver FM2100-000 Vacuum Sealing System is very conventional in nature as it reduces the amount of space taken up on countertops. The vertical design of the sealer allows for compact storing as well which means the user can easily store away the vacuum sealer when not in use. There is also an additional retractable drip tray given which is dishwasher friendly. For added control over the kind of airtight vacuuming one is looking for, the manufacturers of the FoodSaver FM2100-000 Vacuum Sealing System has integrated separate settings for moist and dry food items. This means depending on your food item you can choose your preferred setting which also adds to the overall quality of the airtight seal and the longevity of the food intended for storing away. The FoodSaver FM2100-000 Vacuum Sealing System significantly reduces the amount of bag waste by allowing the user the control of choosing when and where to cut off the bag seal before the airtight vacuum process begins. By reducing the waste to 40%, the user doesn’t have to worry about excessive storage space being taken up unnecessarily. The hand-held external port hose allows users to airtight seal multiple different carriers including zip lock bags and cannisters. The retractable drip tray makes it easy to clean up and hence increase the overall life span of the machine. The strong lock and latch bar in the machine allows for producing and tight solid seal which makes it easy to seal bags at optimal speed. There aren’t any separate functions given for moist and dry food items. Whether you are looking to seal away bags at an automated rate or make your own custom sized bags to seal, the FoodSaver FM2000-FFP Vacuum Sealing System with Starter Bag/Roll Set, Black is built to take care of all your needs! For users looking to create their own custom sized bags for sealing, there are separate buttons given for sealing as well that allow the user to cut the bag at the optimal length that they are looking for from the integrated bag material roll fed into the machine. This means that the amount of excessive storage space is also reduced phenomenally and users can space bag material up to 40%! One of the best features of the FoodSaver FM2000-FFP Vacuum Sealing System with Starter Bag/Roll Set, Black is that it comes with fully automated functions which means that there is a dual-purpose button given that not only creates the vacuum in the container but also seal to it. The sealing automatically stops when the bag is completely airtight and ready for storage. 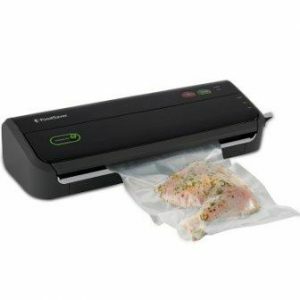 The FoodSaver FM2000-FFP Vacuum Sealing System with Starter Bag/Roll Set, Black is easy to clean and store away when not in use. The retractable and dishwasher friendly drip tray is built to accumulate all the excessive liquids in one place so that the interior of the appliance stays protected for longer durations hence increasing the overall life of the appliance. The user doesn’t have to spend extra time overlooking the vacuuming and sealing process as it is fully automated for convenience. Incase you are using separate bags, there is an easy lock and latch system given that helps make some of the best long-lasting vacuum seals ever! The wide strong heat seal helps lock in the vacuum best to increase the overall longevity of the food being stored away. Some users complained that the sealing mechanism would only seal about 75% of the bag after doing many successive seals. Creating vacuum seals where never easier for with the FoodSaver V2244 Vacuum Sealing System with Starter Kit you can not only airtight seal external carriers but also place delicate foods through the sealing process without worrying about them getting crushed. Unlike other models from Food Saver, the FoodSaver V2244 Vacuum Sealing System with Starter Kit is built for manual operation without an integrated bag material roll up. This means that the user can seal bags according to their preferred length and size without worrying about excessive bag material waste. Furthermore, the lock and latch mechanism ensure a much more tighter seal. 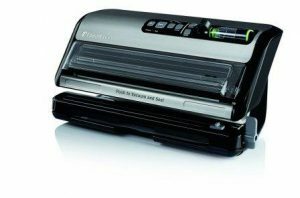 The FoodSaver V2244 Vacuum Sealing System with Starter Kit is compact in nature and easy to store away when not in use. The lack of extra automated functions means that the machine is not only easy to operate but also maintain without worrying about messing up with any of the functions given. There is a retractable drip tray also given which can be easily washed multiple times before and after use to increase the longevity of the machine. With the external hand-held port given in the FoodSaver V2244 Vacuum Sealing System with Starter Kit, the user can airtight seal several different carriers including zip lock bags and other cannisters. This means that users are not dependent on the sealing that the machine is providing only with the lock and latch function integrated in it. The compact size of the appliance makes it easy for users to store it away when not in use or relocate according to convenience. The dishwasher safe drip tray reduces overall manual hours otherwise spent in handwashing and increases the lifespan of the appliance. The vacuum and sealing function is fast and sturdy hence making bulk sealing convenient. The FoodSaver V2244 Vacuum Sealing System with Starter Kit doesn’t come with an integrated bag material roll up within the appliance. Food is perhaps the most central of all problems in today’s world! However, with vacuum sealing machines, people can not only invest in healthier food options but also significantly reduce waste and eliminate excessive costs associated with food wastage and packaging options!